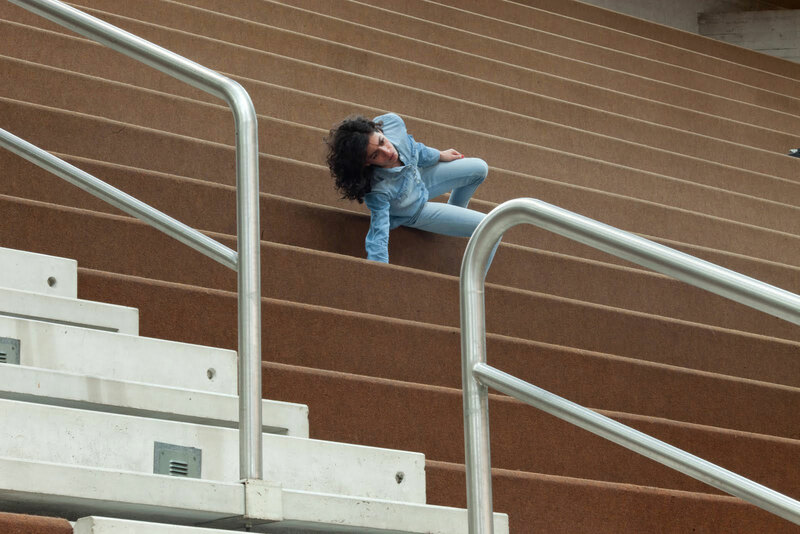 The New York–based director, choreographer, and artist Maria Hassabi (b. 1973, Nicosia, Cyprus) received a BFA in performance and choreography in 1994 from the California Institute of the Arts. Hassabi’s works have been presented internationally in theaters, festivals, museums, galleries, and public spaces, including Kunstenfestivaldesarts, Brussels (2014); Steirischer Herbst, Graz, Austria (2014); Le Mouvement: Performing the City, CentrePasquArt, Biel, Switzerland (2014); Kunsthall Oslo (2014); Performa, New York (2013, 2009); the 55th Venice Biennale (2013); ImPulsTanz, Vienna (2013, 2011, 2006); Centre d’Art Contemporain, Geneva (2012); Springdance Festival, Utrecht, Netherlands (2012); The Kitchen, New York (2013, 2011, 2006); Kaaitheater, Brussels (2014, 2013, 2010); Middelheim Museum, Antwerp, Belgium (2012); deSingel, Antwerp, Belgium (2011, 2010); Tanz im August, Berlin (2011); Museo Soumaya, Mexico City (2011); Panorama Festival, Rio de Janeiro (2012); Festival Contemporâneo de Dança, São Paulo (2012); and Portland Institute for Contemporary Art TBA Festival, Portland, Oregon (2010). Hassabi is a 2011 Guggenheim Fellow and a recipient of the 2009 Foundation for Contemporary Arts, Grants to Artists Award. During her residency, Maria Hassabi spent time in Los Angeles initially to meet with local dancers and choreographers to prepare for her Hammer Projects exhibition. She looked for rehearsal spaces and programs that would become collaborators on her Project. Hassabi returned to Los Angeles to train other dancers and perform PLASTIC (2015) in Hammer Projects: Maria Hassabi daily.